Is your car suffering from an orange peel effect? An orange peel effect refers to when the texture of your car’s surface looks like that of an orange skin, and it is normally seen after a vehicle has had a new paint job. Perhaps your car hasn’t had a paint job recently, but there appears to be scratches on the old paint. Whether you’re dealing with an orange peel effect on new paint or scuffs on old paint, you might be seeking a way of restoring the paint’s luster. And do you know what could work superbly for you? Wet sanding is great for smoothing the surface of a car and enhancing the glow, but when done incorrectly, it can have damaging effects. 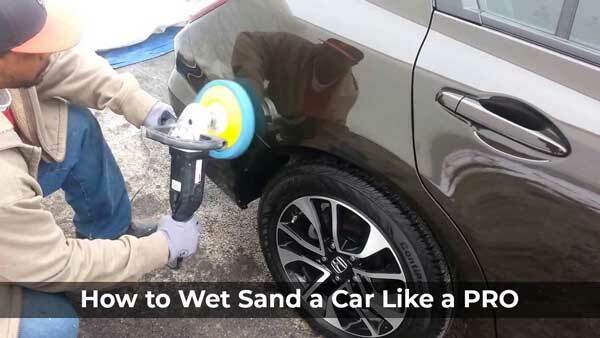 That’s why you got to learn how to wet sand your car correctly, and in this post, you will learn how to do it like a pro. Wet sanding involves gritting away particles from the surface of an object with water or another liquid being used as a lubricant between the sandpaper and the surface being sanded. The purpose of the lubricant is to prevent the buildup of material on the sandpaper, so there’s even sanding. When done properly on the surface of a car, it boosts not just the smoothness but also the shine. We will start with step 1 – the preparation. 1. Is it appropriate for your car? Wet sanding might be a great way of taking care of shallow scratches on the car’s clear coat, but it is obviously not going to be very helpful if the scratches are deep such that they reach the metal. So, bear in mind that wet sanding is suitable only for the top layer and clear coat issues as opposed to deep scratches. Is the scuffing on your clear coat only light? Then the sanding will be easy and quick, and you will be able to solve it in one step with a 2000 or 3000 grit sandpaper. However, if the damage is significant, then you will need to go through several steps, probably starting with a 1200 grit sandpaper and moving on to a higher grit number. Remember, sandpapers with a higher the grit number have a finer abrasive surface. You can purchase these sandpapers from your local hardware store. You don’t want to go for sandpapers with a grit number lower than 1200 as these might damage the car’s surface rather than repairing it. As mentioned before, wet sanding is about using water or other liquid while sanding the surface of your car. So, get a big container like a bucket and pour some water and a little automotive or dish soap in there. Ensure the soap isn’t also usable as a polish or wax. Take the sheets of the sandpaper and cut them into halves along their lengths. The reason as to why you’re doing this is so that you can easily wrap the sandpaper around a squeegee. Long sandpaper strips are also easier to dip in water and wet. Dip each sheet of sandpaper in the lubricant and let it soak for around 5 minutes or until at least half of its length is totally saturated with the lubricant. Ensure there’s a section of the sandpaper strip that is dry so it can securely attach to the squeegee. After preparing for the exercise, now it’s time for the juicy part. So, let’s move onto step 2. It’s crucial that you clean the area you’re looking to wet sand. If you intend to wet sand the entire car, use a sponge and some water and soap to wash it, then rinse it properly. Use some dry microfiber towels to dry the car totally before wet sanding it. You might be tempted to take the sandpaper in your hands and start wet sanding the car immediately, but that will only result in uneven sanding as the gap between your fingers presents inconsistency. Wrapping the sandpaper around a pad or squeegee ensures you get an even sanding. Based on your preferences as well as suitability for the area you’re sanding, you could choose to use either a curved, bendable or flat handle. There should be directions on the sanding squeegee on how to secure sandpaper to it; follow them. We’re hoping you have already soaked the sandpaper in the lubricant. Now, sand the surface of the car gently, preferably in circular motions. You can apply a little pressure but don’t apply too much of it as you don’t want to scratch the paint. Pay attention to how the sanding is affecting the paint. Try sanding the vehicle evenly, giving uniform attention to all the parts of the vehicle. You can approach the surface from varying angles by shifting the direction of the circular motions now and then. As you change the direction of your motions, and throughout the sanding exercise, ensure you’re not changing the amount of pressure you’re applying on the sandpaper. The color of the paint bleeding into the sandpaper from the vehicle should be only light; if it’s significant, then you’re probably applying too much pressure on the sandpaper. Don’t wait till the sandpaper gets dry to lubricate it some more. The objective is to wet sand the vehicle to avoid damage to the paint, so be sure to add lubricant to the sandpaper now and then. You could even splash some of the soapy water on the car. Many people get tired after wet sanding a vehicle for a while, and this increases the odds of rubbing the edges of the sanding tool against the surface of the vehicle. If you feel tired, take a small break and then go on with the task. Take care not to rub the edges or the handle of the tool you’re using against your car, as that will only damage the paint. After sanding the vehicle, it is likely that there are tiny scratches created by the sandpaper. Obviously, there are also little paint and wax particles on the surface, and you need you to get them off. That’s what treating is about. What sandpaper did you use to sand the vehicle during the first sanding exercise? A 1200 or 1500 grit? Sand the vehicle again with finer sandpaper, like a 2000 or 3000 grit. That way, you will be able to get rid of those little scratches and make the surface much finer. Remember, if the vehicle had very light scuffing in the first place, you would use only a 2000 or 3000 grit sandpaper, and you’d be all done in one stage. Be sure to keep the area you’re sanding wet to avoid damaging the finish. As soon as you’re done sanding the area with finer sandpaper, rinse the vehicle completely, ensuring all the debris is gone; a hose will be very helpful. Use some microfiber towels to dry the car totally. When you touch the surface with your hands, you shouldn’t feel any soapy residue. Caution: you should never place your car in direct sunlight to dry if you don’t want water spots to be formed on the surface of the car. A rubbing compound, a buffer pad, and a power buffer will come in handy for polishing the surface of the car. Set the power buffer to medium speed and low pressure and then buff the rubbing compound into the car’s surface. Warning: extreme pressure can destroy the vehicle’s paint, so apply only light pressure at first, increasing it only as needed. If you were wet sanding only a section of the car’s surface, the paint on there might appear to be shallower than that on the other parts of the vehicle. This is where automotive wax comes into play. It fills the gap and makes the paint job look more uniform. Even if you were sanding the entire vehicle, applying a wax coat is still very essential for protection against undesirable processes like fading. So, once you have buffed the paint, it’s time to apply some wax. Get some high-grade wax from an automotive parts shop or online and apply it on the car as an extra protective layer. By the by, waxing also gives your vehicle a fresh, amazing glow making it appear as though it was new. Why not take a quick look at the following frequently asked questions before leaving? It will only take a minute. 1. What exactly does wet sanding mean? Wet sanding refers to sanding your car using sandpaper and some kind of lubrication. Normally, folks use soapy water as lubrication. The purpose of the lubrication is to ease the severity of the grits, so they don’t damage the car’s paintwork. 2. How is wet sanding beneficial? There are plenty of benefits of wet sanding your car. First, it helps reduce the amount of dust being produced, meaning that you’ll have to deal with lesser mess than you’d deal with if it were ordinary sanding. Then, it prevents damage to the surface of the car. Most crucially, wet sanding greatly enhances your ride’s sheen. 3. What is the orange peel on cars and what causes it? The orange peel effect refers to the surface of the car appearing like the peel of an orange; you know, the dots. This undesirable situation it could be as a result of various reasons, among them the premature evaporation of the thinner and the excessive application of paint. Spraying paint at an angle other than the perpendicular angle could also result in an orange peel. Wet sanding is one of the most effective ways of rectifying an orange peel situation.